A draft copy has been circulated to stakeholders, including northern governments and Indigenous groups. 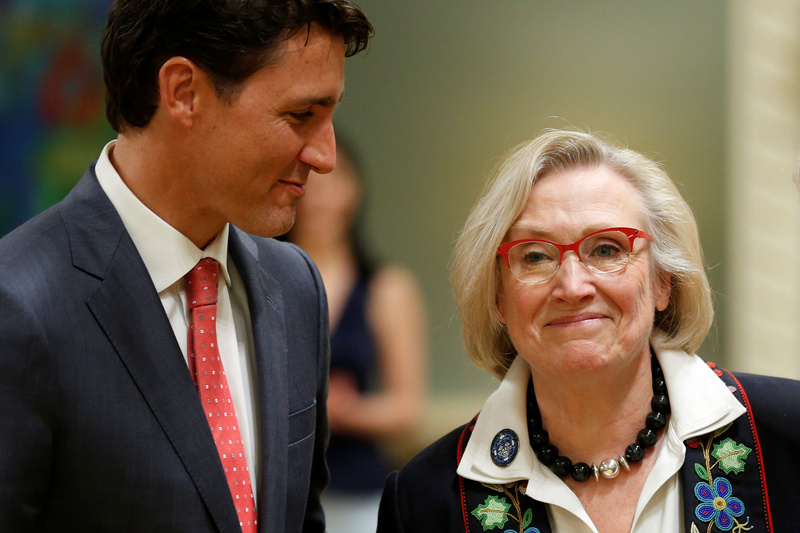 Prime Minister Justin Trudeau declared in December 2016 that his government would develop the new Arctic policy — but although they’re getting to look at an early draft, northern governments and Indigenous organizations are still waiting for its completion. When done, it would replace the 2009 Northern Strategy document and the 2010 Statement on Canada’s Arctic Foreign Policy, both created by Stephen Harper’s Conservative government. After 16 roundtables in northern communities, two reports from the special ministerial representative, Mary Simon, other consultations, and with a national election looming this Oct. 21, federal officials are still unable to give a firm date for its release. Northern Affairs Minister Dominic LeBlanc is actually now in charge of the Arctic policy framework process, but he couldn’t make it to last week’s Senate committee meeting, so Bennett and her officials ended up fielding questions about it themselves last week. “In the Arctic, co-development or co-management is probably further evolved than anywhere else. But the idea that you would take decisions together—as so many of the Indigenous leaders say, it’s a marriage not a divorce,” Bennett told the committee. And that list of “partners” is long, which may explain why the Arctic policy process isn’t done yet. That list now includes the governments of Yukon, Nunavut and the Northwest Territories, as well as First Nations in Yukon, First Nations and Métis in the N.W.T., Inuit organizations, plus Nunavik, Labrador and northern Manitoba. In addition, even more partners want in on the action. Wayne Walsh, a director general of the northern strategic policy branch at Crown-Indigenous Relations and Northern Affairs Canada, said they’re now talking to the NunatuKavut, a group in southern Labrador who claim Inuit ancestry, plus the Innu Nation, also of Labrador. “We’d like to err on the side of inclusion rather than exclusion,” Walsh said. Those stakeholders recently saw a draft copy of the policy framework that has been circulated among them, Walsh said. “We shared advance copies of the draft with those partners to validate what we’ve found and seen,” he said. Following that, the government will incorporate suggested changes and release a new draft, Walsh said. Also, the list of “themes” is growing too, from six to eight. The original six themes took in Arctic infrastructure; Arctic people and communities; sustainable and diversified economies; Arctic science and Indigenous knowledge; protecting the environment, conserving Arctic biodiversity; and the Arctic in a global context. But the policy framework will now also include the theme of reconciliation, and the theme of safety and security, Walsh said. Bennett confirmed this in response to a question from Senator Patricia Bovey, the deputy chair of the committee, saying the new Arctic policy will cover foreign affairs and national security, given the growing interest in the region shown by countries like Russia and China. “It’s the reason why, for the first time, that [the Department of] Global Affairs is very much part of this policy. It’s not a domestic policy. It includes our Arctic sovereignty and everything to do with security,” Bennett said. The issue of Arctic security was underscored earlier this month by news that, for the first time in 30 years, the Russian military will use supersonic jet fighters to patrol the North Pole region. The Norway-based Barents Observer, quoting the Russian newspaper Izvestia, reported that Russia will use MiG-31BM supersonic jets, which can fly 3,000 kilometers without refuelling, to circumnavigate the North Pole on a regular basis. “With flights from both east and west, the Russian fighter jets aim at controlling the entire Arctic air space north of mainland Siberia to beyond the North Pole,” the Barents Observer said. “In terms of the Arctic and northern policy framework, our Yukon partners were uncomfortable with the fact that we started with the Arctic. So it’s now Arctic and northern, because they were not comfortable with Arctic applying to them,” Bennett said. The new Arctic policy framework is supposed to guide the Canadian government’s Arctic activities until 2030. Dennis Patterson, the senator for Nunavut and chair of the special committee, said he hopes the committee will be able to contribute to the Arctic policy framework before it’s finished.